IRVINE, Calif.--(BUSINESS WIRE)--CoreLogic® (NYSE: CLGX), a leading global property information, analytics and data-enabled solutions provider, today released its monthly Loan Performance Insights Report. 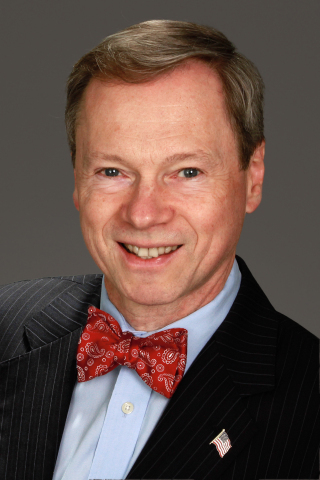 The report shows that, nationally, 4.1 percent of mortgages were in some stage of delinquency (30 days or more past due, including those in foreclosure) in December 2018, representing a 1.2 percentage point decline in the overall delinquency rate compared with December 2017, when it was 5.3 percent. As of December 2018, the foreclosure inventory rate – which measures the share of mortgages in some stage of the foreclosure process – was 0.4 percent, down 0.2 percentage points from December 2017. The December 2018 foreclosure inventory rate tied the November 2018 rate as the lowest for any month since at least January 2000. 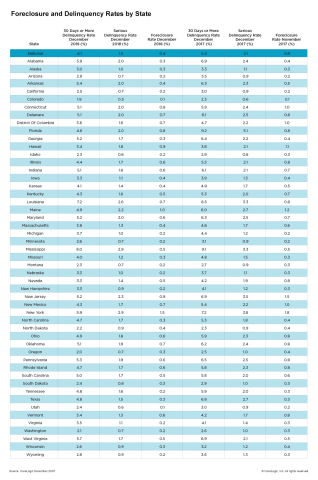 The rate for early-stage delinquencies – defined as 30 to 59 days past due – was 2 percent in December 2018, down from 2.4 percent in December 2017. The share of mortgages that were 60 to 89 days past due in December 2018 was 0.7 percent, down from 0.8 percent in December 2017. The serious delinquency rate – defined as 90 days or more past due, including loans in foreclosure – was 1.5 percent in December 2018, down from 2.1 percent in December 2017. The serious delinquency rate has been steady at 1.5 percent since August 2018 – the lowest level for any month since March 2007 when it was also 1.5 percent. 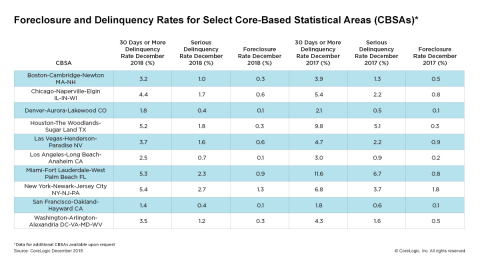 Since early-stage delinquencies can be volatile, CoreLogic also analyzes transition rates. The share of mortgages that transitioned from current to 30 days past due was 0.9 percent in December 2018, down from 1.2 percent in December 2017. By comparison, in January 2007, just before the start of the financial crisis, the current-to-30-day transition rate was 1.2 percent, while it peaked in November 2008 at 2 percent. Since the beginning of 2018, the nation's overall delinquency rate has fallen to pre-housing crisis levels, not seen since early 2006. However, several metropolitan areas in Florida, Georgia and North Carolina are still struggling to recover from natural disasters that impacted those areas. 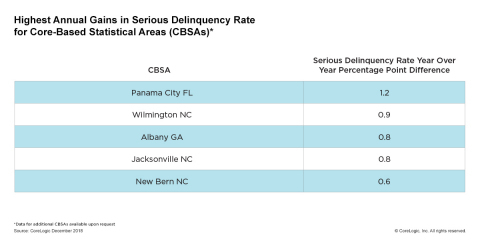 In December 2018, 10 out of the 12 metropolitan areas that logged increases in their serious delinquency rate were located in the Southeast, with the largest gains occurring in the Panama City, Florida metropolitan area. 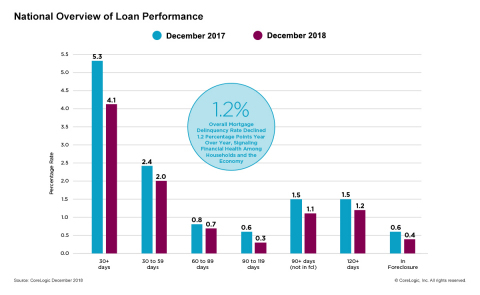 The next CoreLogic Loan Performance Insights Report will be released on April 9, 2019, featuring data for January 2019. The data in this report represents foreclosure and delinquency activity reported through December 2018. CoreLogic Loan Performance Insights Report reveals delinquency rates are up in some natural disaster areas but down nearly everywhere else in December.